The intention of this is merely to supply an appreciation of a book I’ve read only recently. Actually as I write this I have yet to finish it but as I intend this piece to be slightly longer than the few thoughts I write here tonight I am sure that the story will conclude before I do. So it is with caution that I go in search of references, links, by way of a route to take, as tomorrow I plan to walk the streets, feel the vibe, and perhaps take a few photos. A written record will also be deployed, hopefully, and if I am brave enough to chatter into my dictaphone this too may come in handy. Not that babbling away to oneself, or apparently so, is unusual these days what with the number of hands free devices on the market, and more and more of them are becoming less and less conspicuous. It’s getting harder and harder to tell the loons from the rest but perhaps the former are more pointedly recognisable these days by their satisfied silence. We’ll see. It was a Friday and after a week of mulling over the prospect, book in tow to every class, questions asked of every student, a picture began to form. To some it was a mere child’s book though a pride, perhaps a sentimentality, shone behind those eyes, in those expressed words. To others it meant nothing; it was school and all the hardship that that period entailed. Being a mandatory read unfortunately allows in the element of bitterness that comes with the set curriculum of our youth. Some, however, tend to reminisce though this too brings with it a naivety no less tainted than the anger. Neither is the full picture but in setting out along the streets of the story, the places where it all took place, I endeavoured to find at least an element of the truth, if not in the story itself, at minimum in the very life which still reverberates in the heartland of the eighth and ninth districts. My journey began on emerging from the Kalvin ter metro and, following along the Vámhoz Korut towards the river the big market is the first great landmark though the church in Kalvin ter was a surprise, and therefore new to my appreciation, especially since it has been somewhat obscured for the last few years due to the Metro 4 hoardings. 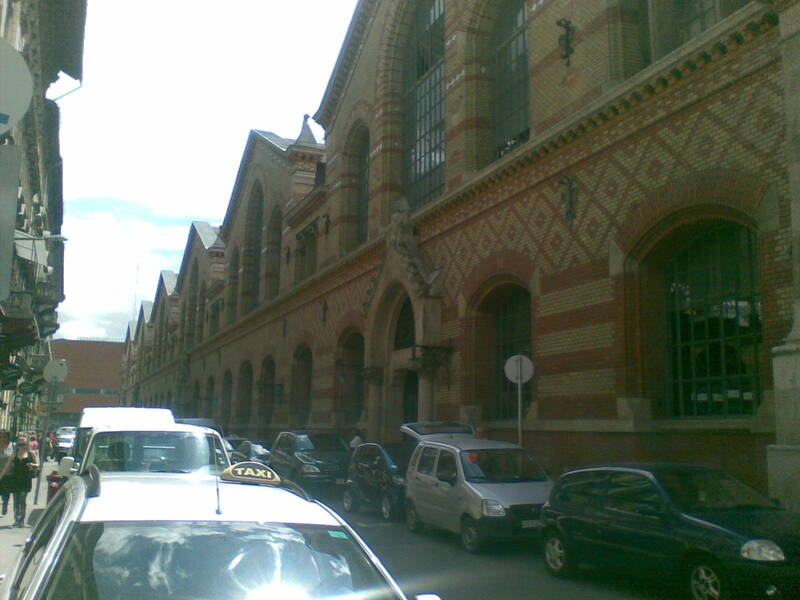 As the red brick of the market building comes into view so also does a little left turn and it’s here that the first street mentioned in the book is encountered, Pipa utca (Pipe street). With phone camera and dictaphone the points of interest would from now on be noted, [using either original phone photos and audio files or a revised photo shoot with Andi and excerpts from the book], any chance to write too inhibiting to the overall progress. This writing, in fact, is taking place in IF café on Raday utca. A moment was needed to stop and collect my first thoughts/impressions; some pictures and sound comments to boot. At this pace a healthy estimate is to finish stage one of the three stage projected walk today. while the City Gate office complex on one side and park/ playground on the other were looking altogether other than what I’d imagined in light of the novel. 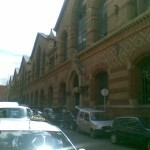 The tobacco warehouse was certainly gone but standing resplendent, was the Jazz School (http://www.lfze.hu/kapcsolat ). Crossing Ulloi and the first the Semmelweiss complexes I was soon at the corner of Maria utca. Road works spoiled the feeling but some of the ramshackle spelt of the wear and tear which probably traversed the period that Nemecsek and co. wandered these same streets. On Maria there are clinics, the eye clinic telling a tale of two halves, for left of the door lay a building dilapidated, windows broken, brickwork crumbling, while above the door and to the right things seemed to be somewhat in order. Could people see this, well you would hope they could, afterall! Was it a sign of the times? With construction sites littered all across the eighth on the far side of the Korut; as in other districts, the old is often forsaken in favour of the new. Like Boka’s shock at the final realization of the fate of the Grund to upward development, maybe here, and now, it’s become about the knock and rebuild, though where there are derelict areas, maybe there is a greater history of war here than I first realized. By here I mean the eighth district, not the city of course. A glance up Pál utca told me that nothing special resided there so I strolled to the junction of Maria and Baross. Looking further along Maria I noticed signs, and lights, and things, but that would be for another day. Today I took Baross to the Korut only to find myself, at the corner of Baross and Jozsef Korut, looking at Stex ( http://www.stexhaz.hu ). I’d taught a student in there once on a lunchtime hour. A good food choice if the walk to this first significant juncture has made one peckish. It, also, has to be noted that on both sides of the Korut running back to Ulloi there are cheaps eats, gyros shops and things while across the street moving into the Corvin area one can find oneself in the newly renovated environs with cafes, cinema and bars abounding. 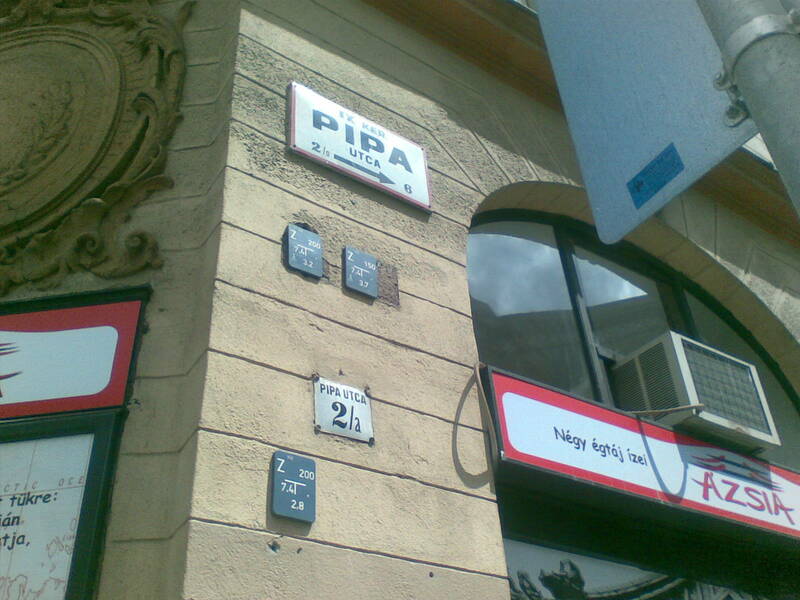 But, for now I wandered back, passing Csepreghy utca, before arriving again at Pál utca. 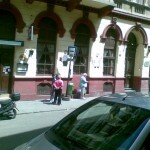 The former has a few offers but Pál utca, except for a sign, and only that, for wine, holds only a Karate club (https://www.facebook.com/gojukaihungary ). The notion that the building that houses this club could have been the one erected… “…come Monday…” …gave it a significance. Wars were, and may still be, fought here. Initially I had the thought with time constraints (I had a class in just over an hour) to finish with a stroll down Kinizsi, left at Knezich and end up where Nemecesk ended up, at number 3 Rákos utca, a name which doesn’t exist anymore (http://members.virtualtourist.com/m/tt/8ecfa/ ). 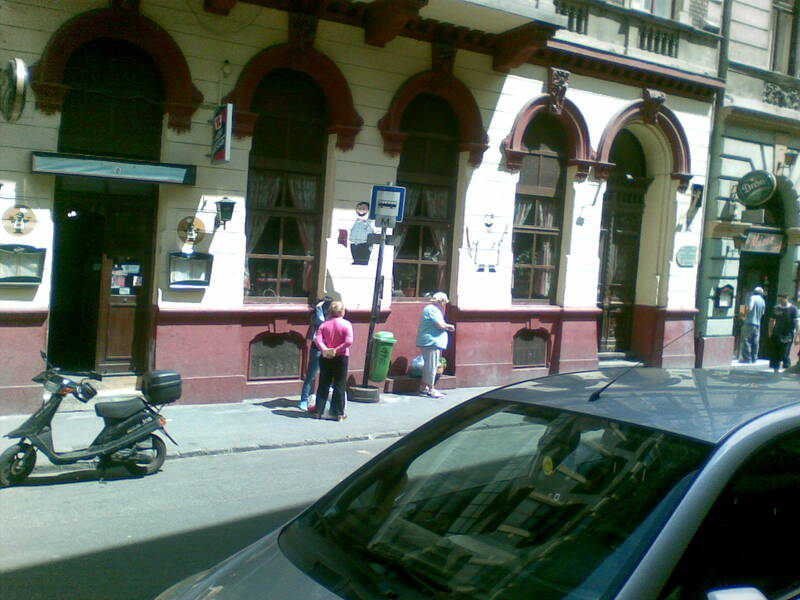 It’s now named Hogyes Endre utca, but there is a building there at No. 3, the sign Unitarius Templom above the door merely suggesting, as does the traffic in and out, that some part of the interior is taken over to prayer, and contributions to renovations of the façade, perhaps. One may even stretch it to a prayer for the soul of a warrior, eternally dying till that page is turned, till his hand runs cold and his skin pale. Eternally living within our hope because for every word Molnar emits, till he finally states it, we, too , search for light like the hapless boys, but, perhaps, in truth the grim reality is more apparent in Nemecsek’s own words, but certainly also in the walk so far. This, time and decay, is the way of things, replacement too, and lest we forget where Boka and his squad had their day with Nemecsek’s heroic contributions, no less honourably in the way of war, and no matter how desperately they were depicted, Feri Ats, his Pásztor boys, and the rest of the Red Shirts, didn’t have theirs. Loss, then, as Nemecsek seems, only, able to see is as a part of this victory, this life, as all else. With a somewhat melancholic disposition I did, in truth, find myself leaving Hogyes Endre utca, though at the time it was a mere emptiness. Now some hours later over notes I have found these words but, one must take into account the fact that it was not until sometime after this first excursion that I finished the book and so it is with a retrospective licence that I complete the gaps of my afternoon’s musings. And gladly. Sauntering back up onto the Korut through the little park area which is at the corner of Hogyes Endre utca and Ulloi I found myself dashing across at the zebras which led me the far side of Jozsef Korut. It still wasn’t too late so I could probably risk rushing up Ulloi towards the Botanical Gardens. The rain which was forecast hadn’t yet come and didn’t seem threatening and therefore I, unlike Nemecsek, would not be suffering for my troubles. In fact, the oppressive state of the atmosphere of late had somewhat dissipated. The sun burned brightly, which was bearable, and with this I was accompanied up past various side streets, past Klinikák metro till finally I veered left at Korányi Sándor utca and along the side of the university, the grounds of which before, would all have constituted the area of the Botanical Gardens. Passing what I roughly translated as the Natural Museum (proper name forthcoming*) on my right I noticed the grounds of the university becoming more and more wooded, almost tropical. I was in the right area, this I knew, but where could I go to collect a photo, a true souvenir, a testimony to the occasion. 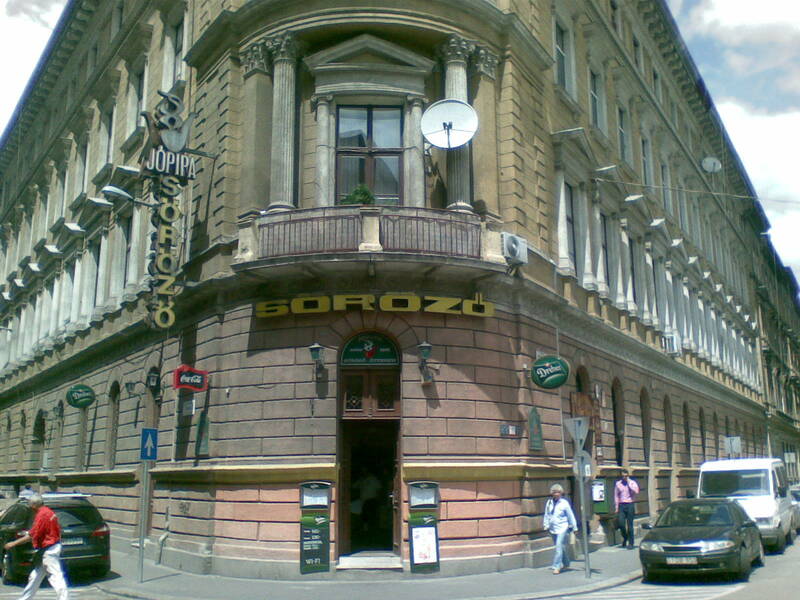 The boys, Boka, Cso’nakos and Nemecsek had first scaled the perimeters of this place on a side street but looking at the map I wondered if that acacia tree may not be on Szigony utca, not Korányi. It didn’t matter. It would, another time. I spotted a sign, passed a flower garden, and was suddenly at the gate. My wonder, even confusion, was precipitated by the realisation that it was almost an anti-climax. The fact that I had neither the time nor the volition to spend my money on entrance at this point helped alleviate any doubts. I would be back, and that was enough for today. 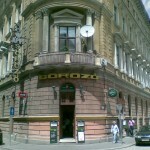 I took my photo, noted a bar on the corner facing the garden entrance, and made my waydown Ille’s utca. As I passed Tomo utca I realized I was straying slightly inwards from the parallel with Ulloi and while this was, in truth, exciting I did have a class in what was now 45 minutes. I headed onwards, however, Práter utca having caught my attention. Turning onto this street I was taken aback by the street life. This place, even if negatively aligned in most people’s minds, still holds an allure born of the very fact that its street corners are teeming with life, at least a lot more so than the residential districts of Buda. Heading back then, down along Práter, I found myself almost wandering past Molnár Ferenc te’r. It didn’t happen, however, and I managed to get the last shot out of my camera phone. Across the street nestled at the bottom of the newer high rises there was a bar full with revelers and I wondered if I could sit among them, and if I’d go unmolested. 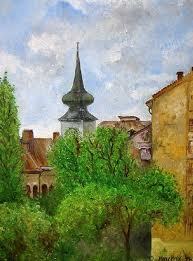 No reason not to except that here more than any other place in Budapest I felt that thorough sense of community! Today was also a work day and so I could legitimately avoid the beckoning to prowess and so it was that I wandered off down Práter my dictaphone sucking from my soul all that I dared reveal. With the Korut back in sight I noticed a few statues clustered and suddenly I became astounded. Here, more than any other place that I had imagined, a sign of the whole episode appeared. There was Nemecsek and his buddies playing marbles and just off two other characters of infamy looked on. There would be an Einstand and there would be a reckoning but at this moment I could prevent neither. I could but look on, impotent in the knowledge that what would transpire had all but spawned from this first distaste. If only I could tell them all, the Pasztor’s too, that this was merely a piece of land, no more, but it wasn’t my place, and I didn’t have time. I rushed on while those figures stood in preparation of what was to come next. What would they have done if they had known I wonder. Just now I’d like to return to the beginnings of all things and why for one did I chose to go on this pilgrimage to Pál street. It wasn’t actually because of a deep love for Ferenc Molnar, I hadn’t read any of him before, nor had I ever heard about that particular book. What drew me to this adventure was by no means connected in any way, or at least that appeared to be the case. It all started with a Russian style breakfast which included blini (pancakes), caviar, sour cream and lilac onions. We had champagne, pezsgo actually but I’m not about to differentiate here, and strawberries which were deftly introduced to the alcohol at some point. There was fresh strawberry jam and homemade scones. Okay I must empahsise Russian ‘style’ here! It was a veritable feast, a taste sensation, a joy to behold… and the fact that it was a breakfast meant it really set us up for the day. Perhaps the pezsgo had us feeling ever so heady, lulling us as is a prerequisite to lazing on a Sunday afternoon. Now how does this relate to Pál street or its environs? It doesn’t but it was there at breakfast, invited as we were by our friends Borcsa and Doma, that I was presented with a book. This book, ” Paddy Clarke ha ha ha” by the Irish writer Roddy Doyle had thus far in life eluded me and in truth I took it somewhat politely. I never expected it to amount ot much, but it worked. It played with my own schoolboy experiences, it reminded me of times and beliefs long left unvisited and, as my girlfriend would later point out, it probably awoke in me some need to revisit and reconsider the impact of that period upon who I am. While reading it I was reminded of a book I had recently bought as a present for my brother, The Paul Street Boys, and I thought that it might complement Doyle’s book as a comparitive of not only two countries, Hungary and Ireland, but also childhood in turn of the century Budapest and sixties suburban Dublin. It was at this juncture that the Pál street saga was truly born. A typical summer’s day…rain and a little bit of sunshine. It didn’t use to be this way, or at least that is what our selective memories want to claim. Personally I do remember more possibilities to get out and about, on adventures not unlike The Paul Street Boys. Growing up on Cork’s Southside in a neighbourhood which falls within the city limits, and which used to be on the extreme peripheries, I experienced all that gang warfare as a child could throw at us. I’ve also witnessed change over the years which has me now on this return home for the summer trying to pick out the familiar on a landscape which is forever morphing. Not that that’s difficult from my family home inwards into the city centre. It’s going outwards through the areas that used to be the bog, the woods, the fields, the countryside; these are the areas I find less recognisible. There are, of course, contours which hint at a bygone familiarity but these are being slowly eroded over time. I say slowly but think back to my father’s memories and the changes he must have witnessed and believe, with a degree of certainty, that my own life has seen progress that would have been multi-generational in any other era. Now change is endemic – in modern society it is a feature. Perhaps it’s this lack of stability, even in our surroundings, that I would like to explore here, and it’s perhaps with both the Paul Street Boys and Roddy Doyle’s Paddy Clark Ha Ha Ha that I can find it, being that both hint at the despair which change can bring. I may never achieve more than a rudimentary commentary on the whole affair but nevertheless I’m still entitled to my endeavour. Forthwith I shall continue unabated, or at minimum undeterred by doubts about this project, a project which still lacks its own clear definition. For a traveller who doesn’t get the opportunity to do so as much as he once did I’m intrigued by the possibility than a literary exploration may find me rambling the highways and byeways of an as of yet relatively unexplored domain…a spontaneous journey into the academic. How utterly uncertain; how bad! Tragedy struck in the way of downloading my photos from my phone to the laptop. 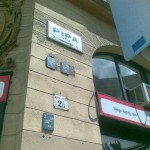 Lost most of the Pál utca tour shots, though never mind cos the streets are still there and are ready to be revisited. I’m wondering as to how I can approach anything concerning this project now without stealing from other things important to me. The family and my work projects taking precedence I’ll still visit here and my project file which I hope is still extant on my C drive. Ode to the techology dinosaur, that he may find his footing in the age of re-enlightenment.